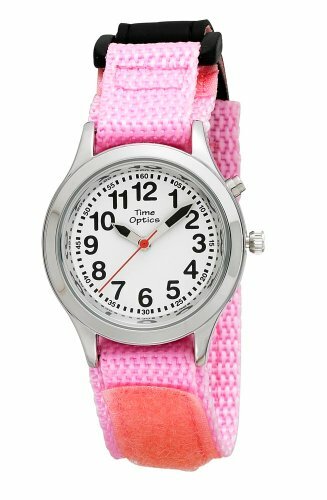 This TimeOptics girls talking watch is both fashionable and functional. Introducing the youth series talking watch collection from TimeOptics that features both a male and female voice option on one watch with a simple press of a button. Other features include the crisp, clear announcement of the time, day, date and year, alarm function plus an advanced movement that synchronizes both the analog and talking time while setting...and setting is easy. Besides sounding great, this timepiece is built to last and looks beautiful. The case is highly polished, the crystal is scratch resistant mineral glass and the comfortable nylon fast wrap Velcro strap is sporty and easily adjustable. The bright white dial with dark contrasting bold black numbers plus the bold fancy hands make the time easy to look at and read. As always, your watch will arrive in a colorful orange gift pouch then boxed, include detailed operating instructions and a hassle free lifetime limited warranty. If you have any questions about this product by TimeOptics, contact us by completing and submitting the form below. If you are looking for a specif part number, please include it with your message.